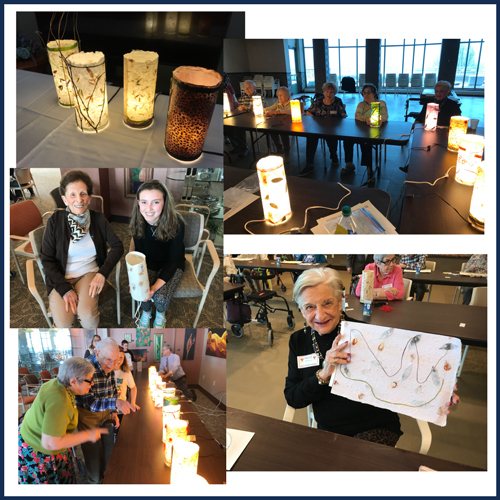 With the generous assistance of the Jewish Home and Care Center Foundation, Ovation Communities is proud to be the first senior living community in the country to host workshops for the Legacy Lights Initiative. In classes ranging from five to 12 participants, the monthly workshops rotate between each of Ovation Communities’ three locations, as well as the Adult Day Center. Workshop participants craft beautiful, one-of-a kind illuminated paper lamps to enjoy and eventually gift, but it isn’t just an art project. At its heart, the Legacy Lights initiative is a meaning-making project, a light-making and light-spreading project, and its primary goal is to honor and celebrate our elders as they share their stories and wisdom. Participants create lamps, or Legacy Lights, while pondering major life questions: What is my legacy? What is my unique light and how have I shared it with the world…and how can I continue to bring more light into the world? The Legacy Lights Initiative is part of the Illumignossi Project, founded by Dr. David Moss. After his sister took a lamp-making workshop in 1999, Dr. Moss began making his own, and eventually worked to simplify the process to teach others how to make their own paper lamps, and use them to illuminate life’s journey. “You don’t have to be an artist to do this. It’s a user friendly process,” says Dr. Moss. In each workshop, while half the time is dedicated to crafting the lamps, participants spend the other half discussing, sharing wisdom within the group, and reflecting. The workshops close with a moving ceremony, when participants turn on lamps for first time and explain the intent behind their creations. During the workshops, residents and facilitators have a unique opportunity to get to know each other in rich and meaningful ways. Participants walk away with a deeper appreciation for their life journey and that of their fellow life travelers. Future workshops will include Ovation volunteers, staff, and family members of residents, to provide opportunities for rich intergenerational exchange.